The song made me think about history and how it is passed down, and how it has strength in its impact. If we read about this part of Ireland’s history in a text-book for example, we might skim, maybe get bored, worry about memorizing the important points for the upcoming test. But when that same piece of history is told in song or story, it becomes, once again, alive. We usually don’t feel tears on our cheeks reading a text-book. When we can take a piece of history and bring it alive through telling of the lives of those who lived it, we not only remember those people, we honor what they lived through. I’m not talking just about this song’s time period, but about all history, from the ages past through to how our parents met. Or the birth story of our child. I’m also not talking about that sad outcome of so many songs based on culture, where they have been sang so often they have become a cliché. Danny Boy comes immediately to mind, to continue the Irish theme. The power of history is in the stories, songs, and photographs that come directly out of the time period. I could write a story about wagon trains and it might ring true, but it wouldn’t have the power of the entries in Women’s Diaries of the Westward Movement. The power of the words is in the source, a story coming from someone who lived through the event. Or from those who remember. Although I have to point out that sometimes the power is in the storyteller. The song above was written in 1800’s about an event in 1798. But still, I’m sure you get my point. So think about the power of storytelling, oral and written, the human, intensely personal aspect that gives words life. In a way this is what all writers strive to bring to their work; words that ring true, that pull up deep emotional responses, and remind us of things that shouldn’t be forgotten. It makes me feel like I have a long, long way to go to reach that place. And it makes me feel very humble. 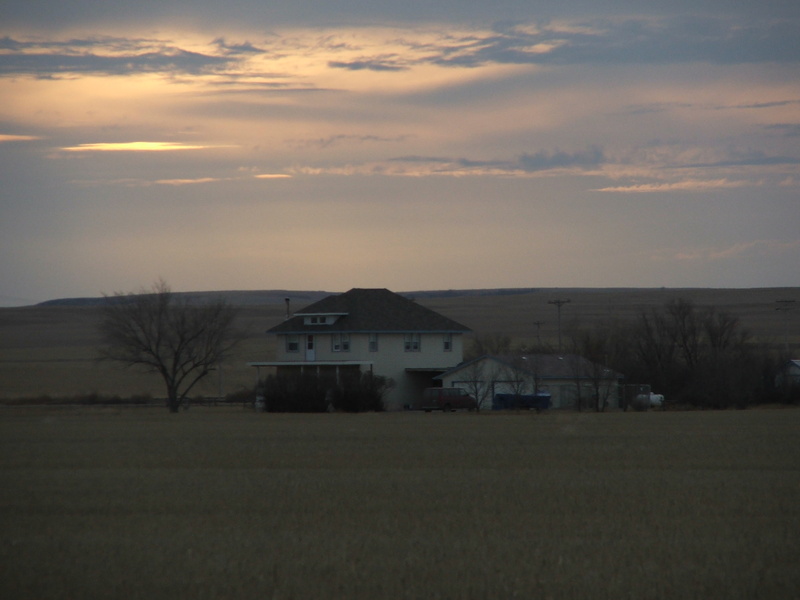 No photos of barley, but here’s a fuzzy one of my sister’s house in the wheat. It’s a sound like “soft winds shook the barley” that makes me feel moved and still and humble. Love what you say here. Yes, sounds can do it, too. I love the wind in the yew trees, the creek running over the log jam, the kissing sounds of fish coming to surface…so many things that remind me I’m part of the whole, and not whole without them. Your post really resonates with me tonight. My stomach hurts a little because this evening I ran into a well meaning short story (I’m sure of it somehow) written by a white woman about a black woman from the time of the Montgomery bus boycott (I think.) She wrote the woman’s speech in difficult to get through dialect form, and the whole piece just felt awful and odd to me. My reaction scared me. I don’t want to have knee jerk reactions to things, but what you said here about history being told most powerfully by those who witnessed it, helps me understand why I was upset. I definitely get the points you made. I agree with you that it’s entirely possible to interpret historical facts and remembrances left behind, imbuing new tellings with powerful truth — like in the song you played for your son. I just wish more writers felt that humbleness you mentioned. I think that’s what makes us do the research and work hard to sharpen our skills. I tried to leave helpful feedback for that writer. My impulse was to rant, but I decided it was better for me to practice open-mindedness instead. I did not read ‘The Help’ for a long time because I didn’t believe a white woman could write realistically about that time period and that subject matter. I anticipated a negative reaction like you mention here. But I did finally give in and read the book, and was surprised to find it was much better than I thought. When you read the acknowledgments in the book though, you realize that the author came to the story with that humbleness, and almost a search for forgiveness. That explained to me why the story worked. And why that desire to always honor our story and strive to do the best we can with our words should be the most important aspect of writing. Have you seen the film Lisa? It is powerful stuff too. Do you remember all those years ago when we listened to the Wolftones? What goes round comes round. My eldest is a fan of theirs now too! I did see the film, but oddly enough, had forgotten that until you mentioned it. The movie was so powerful that I’m not sure I could see it again though. I found it emotionally draining. Ah, the Wolftones! I do believe I still have the 45 single of theirs that we carted home from Ireland in the backpack. Remember the Fureys? Robbie gave me that 45, too. And of course the Dubliners. What a trip down memory lane. I think about history a lot too, always have. I left my history PhD program partly because I felt that history — as we were studying it in the program — was no longer alive and relevant, but was just minutiae for people to make careers on. I had no interest in that kind of history. More recently I’ve recognized that the impulse that brought me originally to history is one that motivates me in art: to honor people’s lived experiences, to make every story count. Now that is profound: to honor people’s lived experiences and to make every story count. In an ideal world that’s exactly what the study of history would be. I can see you doing this in your art, and I’ve seen it in some of your watercolors. I’ll be watching for the posts!